← Just a reminder: The role of urban gardens, family gardens and school gardens. 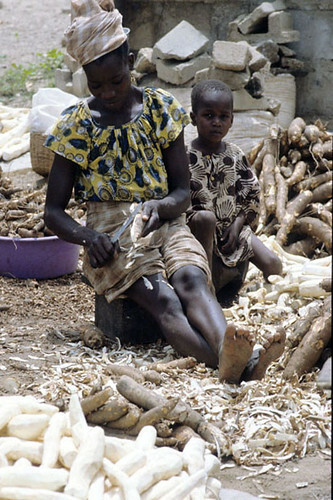 Peeling cassava roots (credit: IITA). New factories that will transform cassava peels into high-quality feed for livestock have been launched in Nigeria. The huge potential for use of cassava peel as fodder in Nigeria was first proposed by three CGIAR centres. Researchers from the International Livestock Research Institute (ILRI), the International Institute of Tropical Agriculture (IITA) and the International Potato Center (CIP), with the support of CGIAR Research Programs on Roots, Tubers and Bananas, Humidtropics, and Livestock and Fish, showed that drying and grading cassava peels could hold the key to providing a readily available and sustainable source of animal feeds, increasing incomes for women and boosting food security in West Africa.